There's a big misconception out there about the nutritional value of cauliflower. In fact, they're incredibly nutritious when cooked despite their mild flavor. 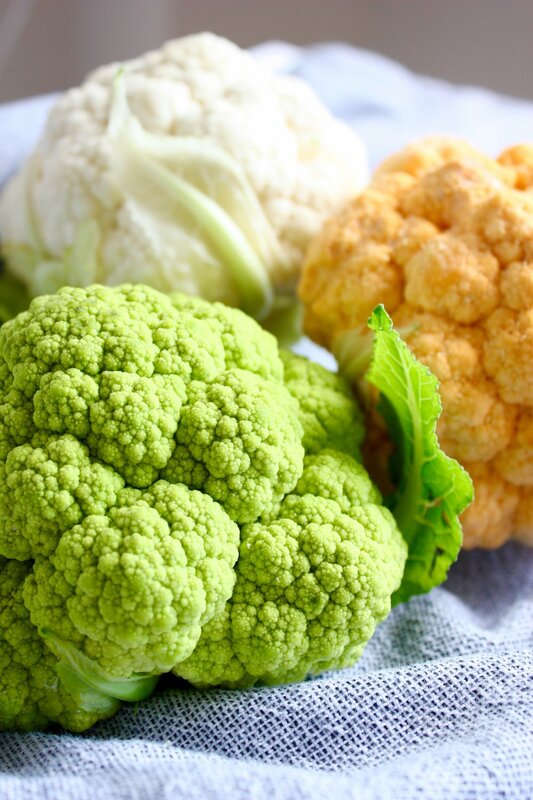 When the cruciferous vegetable is in season, you can find them in a variety of colors at the farmer's market. Something important to look out for when buying your produce at farmer's markets is that some farms have organic and sustainable practices in place but aren't certified organic. Because they don't pay into big ag organic certification doesn't make them any less legitimate or wholesome. The second part of the cooking of these cauliflower heads is some time under the oven broiler. It's super simple and roasting the head of cauliflower whole makes breaking the florets easier than when raw (no crumbling and flyaway florets). Preheat oven to 350°F. Add clean heads of cauliflower to a baking dish, brush with ghee or oil, sprinkle with salt and pepper. Pull apart rosemary sprigs and add if using. Cover with foil or a lid and bake for 35-40 minutes. Remove covering and broil on high for 10-12 minutes.